Travis Parrot and his family invite you to Parrot's Landing, located in the beautiful Silver Lake Sand Dunes Area. Nestled between the shores of Lake Michigan and Silver Lake in Oceana County, this is the place for fun in the sun. From exciting dune rides to relaxing shopping in the village of Silver Lake---it's the perfect spot for families who enjoy the outdoors. 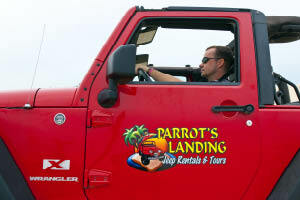 Travis, with the help of his father-in-law, opened Parrot's Landing in 2002, and the business has been growing year by year. They offer the best selection of recreational vehicles for sand or water. 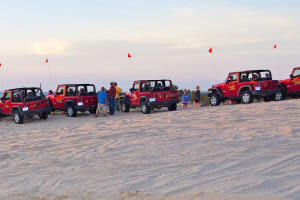 Their Jeep Wranglers are a wonderful way to tour the Silver Lake Sand Dunes. There's room for two in the front, and the back seat holds two adults or three small children. Child safety seats are available upon request. After your tour guide instructs you on using your Jeep, they will lead you up to the dunes, and then your adventure begins! All Jeeps are equipped with two-way radios, so you have the comfort of knowing you're always in touch with your tour guide should you need them. One of the most popular tours at Parrot's Landing is the sunset tour, where you can watch the sun dip down over the lake from the top of a dune. It's an incredible experience you can't afford to miss. Mopeds are a fun way to tour Silver Lake, and Parrot's Landing has Yamaha 49cc mopeds for rent by the hour or day. If water excitement is more to your liking, try one of their 17' open bow ski-boats by Bayliner. They hold seven passengers, perfect for tubing and skiing, and offer the most exciting way to zip around Silver Lake. Parrot's Landing also rents jet-ski watercraft (wave runners), powerful machines that can handle the waves of Lake Michigan. When your time on the dunes or in the water is done, check out Parrot's Landing selection of Silver Lake apparel and mementos, as well as the variety of refreshments. The best fun at reasonable rates--make Parrot's Landing your first stop on your visit to Silver Lake Sand Dunes.